Medicine is a branch of health science and the sector of public life concerned with maintaining or restoring human health through the study, diagnosis, treatment and possible prevention of disease and injury. It is both an area of knowledge – a science of body systems, their diseases and treatment – and the applied practice of that knowledge. Western medical care is shared between medical professionals ( physicians) and other professionals such as physician assistants, nurses and pharmacists, sometimes known as allied health professionals. Historically, only those with a medical doctorate have been considered to practice medicine. Clinicians (licensed professionals who deal with patients) can be physicians, nurses, therapists or others. The medical profession is the social and occupational structure of the group of people formally trained and authorized to apply medical knowledge. Many countries and legal jurisdictions have legal limitations on who may practice medicine. Medicine comprises various specialized sub-branches, such as cardiology, pulmonology, neurology, or other fields such as sports medicine, research or public health. Human societies have had various different systems of health care practice since at least the beginning of recorded history. Medicine, in the modern period, is the mainstream scientific tradition which developed in the Western world since the early Renaissance (around 1450). Many other traditions of health care are still practiced throughout the world; most of these are separate from Western medicine, which is also called biomedicine, allopathic medicine or the Hippocratic tradition. The most highly developed of these are traditional Chinese medicine, Tibetan medicine and the Ayurvedic traditions of India and Sri Lanka. Various non-mainstream traditions of health care have also developed in the Western world. These systems are sometimes considered companions to Hippocratic medicine, and sometimes are seen as competition to the Western tradition. Few of them have any scientific confirmation of their tenets, because if they did they would be brought into the fold of Western medicine. "Medicine" is also often used amongst medical professionals as shorthand for internal medicine. Veterinary medicine is the practice of health care in animal species other than human beings. 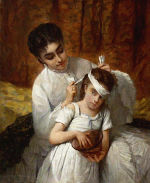 Physician treating a patient. Louvre Museum, Paris, France. The earliest type of medicine in most cultures was the use of plants ( Herbalism) and animal parts. This was usually in concert with 'magic' of various kinds in which: animism (the notion of inanimate objects having spirits); spiritualism (here meaning an appeal to gods or communion with ancestor spirits); shamanism (the vesting of an individual with mystic powers); and divination (the supposed obtaining of truth by magic means), played a major role. The practice of medicine developed gradually, and separately, in ancient Egypt, India, China, Greece, Persia and elsewhere. Medicine as it is practiced now developed largely in the late eighteenth century and early nineteenth century in England (William Harvey, seventeenth century), Germany ( Rudolf Virchow) and France ( Jean-Martin Charcot, Claude Bernard and others). 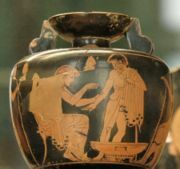 The new, "scientific" medicine (where results are testable and repeatable) replaced early Western traditions of medicine, based on herbalism, the Greek " four humours" and other pre-modern theories. The focal points of development of clinical medicine shifted to the United Kingdom and the USA by the early 1900s (Canadian-born) Sir William Osler, Harvey Cushing). Possibly the major shift in medical thinking was the gradual rejection in the 1400's of what may be called the 'traditional authority' approach to science and medicine. This was the notion that because some prominent person in the past said something must be so, then that was the way it was, and anything one observed to the contrary was an anomaly (which was paralleled by a similar shift in European society in general - see Copernicus's rejection of Ptolemy's theories on astronomy). People like Vesalius led the way in improving upon or indeed rejecting the theories of great authorities from the past such as Galen, Hippocrates, and Avicenna/ Ibn Sina, all of whose theories were in time almost totally discredited. Such new attitudes were also only made possible by the weakening of the Roman Catholic church's power in society, especially in the Republic of Venice. Evidence-based medicine is a recent movement to establish the most effective algorithms of practice (ways of doing things) through the use of the scientific method and modern global information science by collating all the evidence and developing standard protocols which are then disseminated to healthcare providers. One problem with this 'best practice' approach is that it could be seen to stifle novel approaches to treatment. Genomics and knowledge of human genetics is already having some influence on medicine, as the causative genes of most monogenic genetic disorders have now been identified, and the development of techniques in molecular biology and genetics are influencing medical practice and decision-making. Pharmacology has developed from herbalism and many drugs are still derived from plants (atropine, ephedrine, warfarin, aspirin, digoxin, vinca alkaloids, taxol, hyoscine, etc). The modern era really began with Koch's discoveries around 1880 of the transmission of disease by bacteria, and then the discovery of antibiotics shortly thereafter around 1900. The first major class of antibiotics was the sulfa drugs, derived originally from azo dyes. Throughout the twentieth century, major advances in the treatment of infectious diseases were observable in (Western) societies. The medical establishment is now developing drugs that are targeted towards one particular disease process. Thus drugs are being developed to minimise the side effects of prescribed drugs, to treat cancer, geriatric problems, long-term problems (such as high cholesterol), chronic diseases type 2 diabetes, lifestyle and degenerative diseases such as arthritis and Alzheimer's disease. The practice of medicine combines both science as the evidence base and art in the application of this medical knowledge in combination with intuition and clinical judgement to determine the treatment plan for each patient. Central to medicine is the patient- physician relationship established when a person with a health concern seeks a physician's help; the 'medical encounter'. Other health professionals similarly establish a relationship with a patient and may perform various interventions, e.g. nurses, radiographers and therapists. Financing has a great influence as it defines who pays the costs. Aside from tribal cultures, the most significant divide in developed countries is between universal health care and market-based health care (such as practiced in the U.S.). Universal health care might allow or ban a parallel private market. The latter is described as single-payor system. Primary care medical services are provided by physicians or other health professionals who has first contact with a patient seeking medical treatment or care. These occur in physician's office, clinics, nursing homes, schools, home visits and other places close to patients. About 90% of medical visits can be treated by the primary care provider. These include treatment of acute and chronic illnesses, preventive care and health education for all ages and both sexes. The physician- patient relationship and interaction is a central process in the practice of medicine. There are many perspectives from which to understand and describe it. The four great cornerstones of diagnostic medicine are anatomy (structure: what is there), physiology (how the structure/s work), pathology (what goes wrong with the anatomy and physiology) and psychology (mind and behaviour). In addition, the physician should consider the patient in their 'well' context rather than simply as a walking medical condition. This means the socio-political context of the patient (family, work, stress, beliefs) should be assessed as it often offers vital clues to the patient's condition and further management. In more detail, the patient presents a set of complaints (the symptoms) to the physician, who then obtains further information about the patient's symptoms, previous state of health, living conditions, and so forth. The physician then makes a review of systems (ROS) or systems enquiry, which is a set of ordered questions about each major body system in order: general (such as weight loss), endocrine, cardio-respiratory, etc. Next comes the actual physical examination; the findings are recorded, leading to a list of possible diagnoses. These will be in order of probability. The next task is to enlist the patient's agreement to a management plan, which will include treatment as well as plans for follow-up. Importantly, during this process the healthcare provider educates the patient about the causes, progression, outcomes, and possible treatments of his ailments, as well as often providing advice for maintaining health. This teaching relationship is the basis of calling the physician doctor, which originally meant "teacher" in Latin. The patient- physician relationship is additionally complicated by the patient's suffering (patient derives from the Latin patior, "suffer") and limited ability to relieve it on his/her own. The physician's expertise comes from his knowledge of what is healthy and normal contrasted with knowledge and experience of other people who have suffered similar symptoms (unhealthy and abnormal), and the proven ability to relieve it with medicines ( pharmacology) or other therapies about which the patient may initially have little knowledge, although the latter may be better performed by a pharmacist. The quality of the patient- physician relationship is important to both parties. The better the relationship in terms of mutual respect, knowledge, trust, shared values and perspectives about disease and life, and time available, the better will be the amount and quality of information about the patient's disease transferred in both directions, enhancing accuracy of diagnosis and increasing the patient's knowledge about the disease. Where such a relationship is poor the physician's ability to make a full assessment is compromised and the patient is more likely to distrust the diagnosis and proposed treatment. In these circumstances and also in cases where there is genuine divergence of medical opinions, a second opinion from another physician may be sought. Medications: what drugs the patient takes including over-the-counter, and home remedies, as well as herbal medicines/herbal remedies such as St. John's Wort. Allergies are recorded. Review of systems (ROS) or systems enquiry: an set of additional questions to ask which may be missed on HPI, generally following the body's main organ systems ( heart, lungs, digestive tract, urinary tract, etc). Working together as an interdisciplinary team, many highly trained health professionals besides medical practitioners are involved in the delivery of modern health care. Some examples include: nurses, laboratory scientists, pharmacists, physiotherapists, respiratory therapists, speech therapists, occupational therapists, dietitians and bioengineers. Physician assistants, nurse practitioners and midwives treat patients and prescribe medication in many legal jurisdictions. Veterinarians applies similar techniques as physicians to the care of animals. Physicians have many specializations and subspecializations which are listed below. There are variations from country to country regarding which specialities certain subspecialities are in. Clinical laboratory sciences are the clinical diagnostic services which apply laboratory techniques to diagnosis and management of patients. In the United States these services are supervised by a pathologist. The personnel that work in these medical laboratory departments are technically trained staff, each of whom usually hold a medical technology degree, who actually perform the tests, assays, and procedures needed for providing the specific services. Pathology is the branch of medicine that deals with the study of diseases and the morphologic, physiologic changes produced by them. As a diagnostic specialty, pathology can be considered the basis of modern scientific medical knowledge and plays a large rôle in evidence-based medicine. Many modern molecular tests such as flow cytometry, polymerase chain reaction (PCR), immunohistochemistry, cytogenetics, gene rearragements studies and fluorescent in situ hybridization (FISH) fall within the territory of pathology. Anesthesiology (AE) or anaesthesia (BE) is the clinical discipline concerned with providing anesthesia. Pain medicine is often practiced by specialised anesthesiologists. General practice, family practice, family medicine or primary care is, in many countries, the first port-of-call for patients with non-emergency medical problems. Family practitioners are usually able to treat over 90% of all complaints without referring to specialists. Neurology is concerned with the diagnosis and treatment of nervous system diseases. It is a subspeciality of general medicine in the UK. 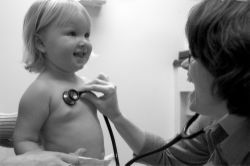 Pediatrics (AE) or paediatrics (BE) is devoted to the care of infants, children, and adolescents. Like internal medicine, there are many pediatric subspecialities for specific age ranges, organ systems, disease classes, and sites of care delivery. Most subspecialities of adult medicine have a pediatric equivalent such as pediatric cardiology, pediatric endocrinology, pediatric gastroenterology, pediatric hematology, pediatric oncology, pediatric ophthalmology, and neonatology. Psychiatry is the branch of medicine concerned with the bio-psycho-social study of the etiology, diagnosis, treatment and prevention of cognitive, perceptual, emotional and behavioural disorders. Related non-medical fields include psychotherapy and clinical psychology. Radiation therapy is concerned with the therapeutic use of ionizing radiation and high energy elementary particle beams in patient treatment. Radiology is concerned with the interpretation of imaging modalities including x-rays, ultrasound, radioisotopes, and MRI (Magnetic Resonance Imaging). A newer branch of radiology, interventional radiology, is concerned with using medical devices to access areas of the body with minimally invasive techniques. Surgical specialties employ operative treatment. These include Orthopedics, Urology, Ophthalmology, Neurosurgery, Plastic Surgery, Otolaryngology and various subspecialties such as transplant and cardiothoracic. Some disciplines are highly specialized and are often not considered subdisciplines of surgery, although their naming might suggest so. Medical humanities includes the humanities (literature, philosophy, ethics, history and religion), social science (anthropology, cultural studies, psychology, sociology), and the arts (literature, theatre, film, and visual arts) and their application to medical education and practice. eHealth, Medical informatics, and medical computer science are relatively recent fields that deal with the application of computers and information technology to medicine. Sports medicine deals with the treatment and preventive care of athletics, amateur and professional. The team includes specialty physicians and surgeons, athletic trainers, physical therapists, coaches, other personnel, and, of course, the athlete. Medical education is education related to the practice of being a medical practitioner, either the initial training to become a physician or further training thereafter. Medical education and training varies considerably across the world, however typically involves entry level education at a university medical school, followed by a period of supervised practice ( Internship and/or Residency) and possibly postgraduate vocational training. Continuing medical education is a requirement of many regulatory authorities. In most countries, it is a legal requirement for medical doctors to be licensed or registered. In general, this entails a medical degree from a university and accreditation by a medical board or an equivalent national organization, which may ask the applicant to pass exams. This restricts the considerable legal authority of the medical profession to physicians that are trained and qualified by national standards. It is also intended as an assurance to patients and as a safeguard against charlatans that practice inadequate medicine for personal gain. While the laws generally require medical doctors to be trained in "evidence based", Western, or Hippocratic Medicine, they are not intended to discourage different paradigms of health and healing, such as alternative medicine or faith healing. Criticism of medicine has a long history. In the Middle Ages, some people did not consider it a profession suitable for Christians, as disease was often considered God sent. God was considered to be the 'divine physician' who sent illness or healing depending on his will. However many monastic orders, particularly the Benedictines, considered the care of the sick as their chief work of mercy. Barber-surgeons (they had the sharpest knives) generally had a bad reputation that was not to improve until the development of academic surgery as a speciality of medicine, rather than an accessory field. Perhaps the most devastating criticism of modern medicine came from Ivan Illich. In his 1976 work Medical Nemesis, Illich stated that modern medicine only medicalises disease and causes loss of health and wellness, while generally failing to restore health by eliminating disease. This medicalisation of disease forces the human to become a lifelong patient.Other less radical philosophers have voiced similar views, but none were as virulent as Illich. Another example can be found in Technopoly: The Surrender of Culture to Technology by Neil Postman, 1992, which criticises overreliance on technological means in medicine. The inability of modern medicine to properly address many common complaints continues to prompt many people to seek support from alternative medicine. Although most alternative approaches lack scientific validation, some may be effective in individual cases. The bioscience and alternative health care paradigms may differ to such an extent that what constitutes scientific evidence is contested. Many physicians practice alternative medicine alongside "orthodox" approaches but the general body of medical practitioners is often criticised for ignoring the purported value of alternative medicine. Medical errors are also the focus of many complaints and negative coverage. Practitioners of human factors engineering believe that there is much that medicine may usefully gain by emulating concepts in aviation safety, where it was long ago realized that it is dangerous to place too much responsibility on one "superhuman" individual and expect him or her not to make errors. Reporting systems and checking mechanisms are becoming more common in identifying sources of error and improving practice. Radical critics of certain medical traditions may hold that whole fields or traditions of medicine are intrinsically harmful or ineffective. They would reject any use or support of practices belonging to that tradition. However, generally, there is a spectrum of efficacy on which all traditions lie; some are more effective, some are less effective, but nearly all contain some harmful practices and some effective ones. Naturally, though, most individuals or groups seeking a health care practice to improve their own health would seek a tradition with the maximum degree of efficacy. There is no doubt whatsoever that Western Allopathic medicine, together with its cohorts of improved hygiene and nutrition, have been collectively responsible for most of the improvements in health worldwide over the last century or so, including: increasing longevity, decreased child mortality, increasing population numbers, better ability to monitor and halt disease spread and outbreaks, improved access to health care for all strata of society.